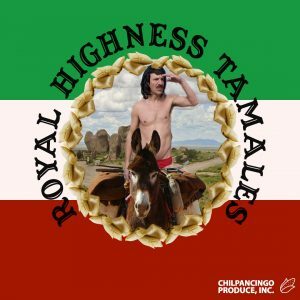 World renowned performance artist Silverio is proud to announce his newest venture, and his first entry into the pre-prepared food market, Royal Highness Tamales. The collaboration with Mexico’s most respected DJ and Chilpancingo Produce, Inc will be distributed in grocery stores and select restaurants starting this summer. Ruido Fest will host the exclusive premier of the tasty treat, which will be tossed at fans from the stage during his set. Tamales will also be available for purchase to throw at Silverio. Be sure to stop by Chilpancingo Produce’s tent because supplies will go fast! For more information on Royal Highness Tamales, go to ROYALHIGHNESS.COM or RUIDOFEST.COM/NEWS.